The prospect of Brexit is changing the dynamic on the ground in Northern Ireland. Whitehall's failure to come up with a way of keeping its promises on both Brexit and the Good Friday Agreement is causing huge problems for the UK in negotiations, to the extent that yet another deadline will be missed at next week's summit. But it's clearly impacting the mood in Northern Ireland as well. How much, though, is another matter. Lord Ashcroft's poll, published 17 June, is the most recent. He found less than half of respondents, 49%, in favour of remaining in the UK, 44% in favour of a United Ireland, and 7% don't knows. The survey was carried out in late May. The annual Northern Ireland Life and Times Survey, released on 13 June, found 55% favouring the UK, 22% a United Ireland, 10% don't knows and 12% who wouldn't vote (an option not offered by Lord Ashcroft). The survey had been carried out over the winter months. 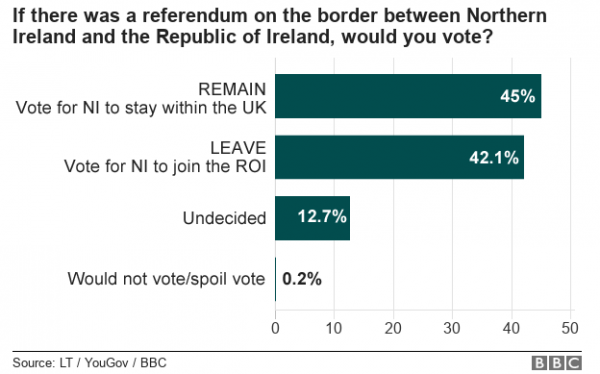 A poll carried out for the BBC by Lucid Talk, published on 6 June, found only 45% who would vote for Northern Ireland to stay in the UK, 42.1% who would vote for a United Ireland, 12.7% undecided and a mere 0.1% who would not vote. The survey was carried out in early May. 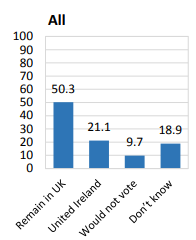 An Ipsos Mori poll published on 9 June and carried out for a QUB research project put the question a bit differently, looking not at how people would vote now but how they think they might vote post-Brexit. Asked "When the UK leaves the EU, if there was a referendum in Northern Ireland asking people whether they want Northern Ireland to remain in the United Kingdom or to re-unify with the rest of Ireland, how would you vote in that referendum? ", the results were 50.3% to remain in the UK, 21.1% for a United Ireland, 18.9% don't knows and 9.7% who would not vote. The survey was carried out in February and March, ie after the NILT survey. Even more theoretically, an earlier Lucid Talk poll from last December, carried out for the GUE/NGL Group of the European Parliament (of which Sinn Féin's MEPs are members) asked the question, "In the context of a 'Hard Brexit' and Northern Ireland leaving the EU with no deal on the border, the Good Friday Agreement or citizen's rights; if the question used in a NI Border Poll Referendum was: Should Northern Ireland REMAIN in the European Union through joining the Republic of Ireland or LEAVE the European Union by staying in the United Kingdom? If a NI Border Poll Referendum was held tomorrow (using this question) which way would you vote?" the results were 47.9% to remain in the EU by joining a United Ireland and only 45.4% for staying in the UK and leaving the EU, with 6.0% don't knows and 0.7% wouldn't votes. I have to say that from a purely technical point of view I don't find the wording of the question very satisfactory - respondents are asked to consider a rather specific (and I think unlikely) scenario as if it had already happened last week with the referendum tomorrow. 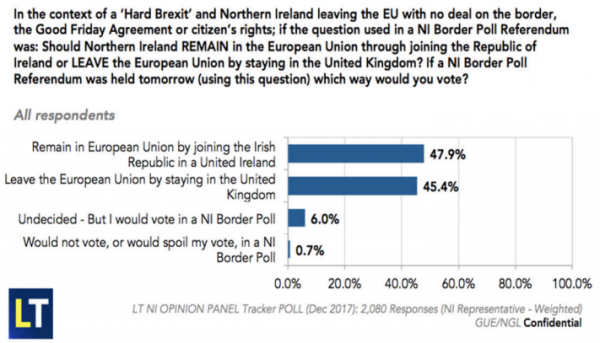 Leaving that aside, it's clear that of the four polls published in the last five weeks, two (the academic ones for NILT and QUB, carried out earlier) found more than 50% in favour of staying with the UK and only 21%/22% favouring a United Ireland; whereas Lord Ashcroft and Lucid Talk (who did their surveys more recently) both found a much narrower gap, with the UK still the more preferred option but below 50%, and supporters of a United Ireland in the lower 40s. I do not believe that public sentiment shifted much between February and May. To me the most obvious conclusion to be drawn is that at least two of these polls, and perhaps all four, have seriously messed up their methodology. Having dabbled in this a bit myself, I'm very aware that an awful lot can depend on the training of the people with the flipcharts and the accuracy of sampling and weighting; not to mention how the questions are sequenced with other questions in the poll. 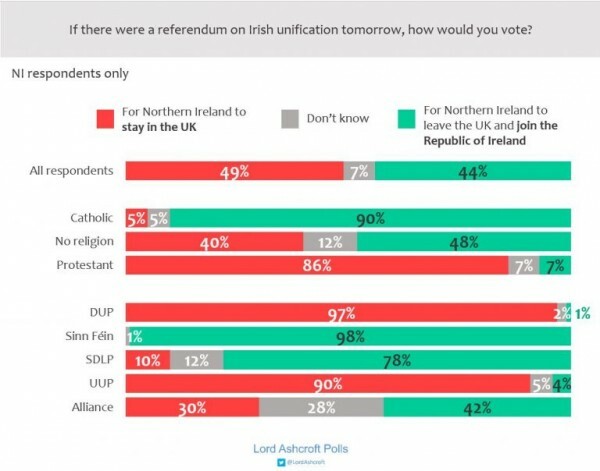 The numbers suggest that there is a group of 10-12% who told IPSOS Mori/QUB and NILT that they would not vote at all, and then told Ashcroft and Lucid Talk that they would vote for a United Ireland, but that does not explain all of the difference. I'm sure that public opinion is shifting. Gerry Lynch has a great piece up on Slugger about the revolutionary times that we are in. But it's not clear where we are, let alone where we are going. A news item during the week flagged up to me the 452-page report by Senator Mark Daly, with the title Brexit and the Future of Ireland: Uniting Ireland & Its People in Peace & Prosperity, published by the Oireachtas Joint Committee on the Implementation of the Good Friday Agreement last summer. I am sorry to say that it is a poor piece of work on an important subject. Almost all of the good bits are blatantly cut and pasted from the 2009 book Countdown to Unity by Richard Humphreys, an Irish judge. Almost all of the rest is cut and pasted from various other sources. The text has many spelling errors - "Hungry" for "Hungary", the border described as "preamble" rather than "permeable", and the gorgeous prospect of a "lassie faire approach". The internal presentation is very confusing. In a two-part review, John Barry says he'd have given it a high 2.2 if it was submitted by a student; I am not sure that I would be so generous. Having said that, there are some particular points of interest. One chapter deals with the EU approach to reunifying Germany and the prospects for reuniting Cyprus, and also points out the precedents of Saarland (which I knew about) and St Pierre and Miquelon (which was new to me); there's a lot of good material there from experts. There's some very interesting reflection (mostly cut and pasted from Richard Humphreys) about how the Irish constitution would need to adapt to absorb Northern Ireland, possibly to the point that it would need to be completely rewritten (and that is with the very large assumption that Unionists accept an eventual referendum result gracefully). It's good that some people in the Republic are now starting to think seriously about the implications for their own state of a United ireland, but I hope that the next stage in the process is better prepared than this.